You really do. Your heart and your arteries might not, but who cares what they think. Man, we're talking burgers here. Burgers. 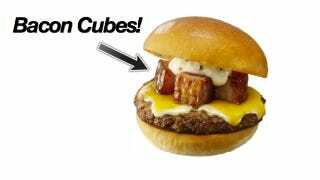 Lotteria, the most mental fast food chain in Japan (proof here, here, and um, here), is rolling out the Bacon Cube Deluxe Cheese Burger (Kakugiri Beekon Zeppin Chiizu Baagaa or 角切りベーコン絶品チーズバーガー). Priced at 490 yen (US$4.90), it's served with truffle sauce and goes on sale for a limited time only starting November 29 in Japan.